The entrepreneurial 50 Cent will have to wait a while longer before his sponsored line of El Camino-styled truck can be found cruising throughout the asphalt jungle. 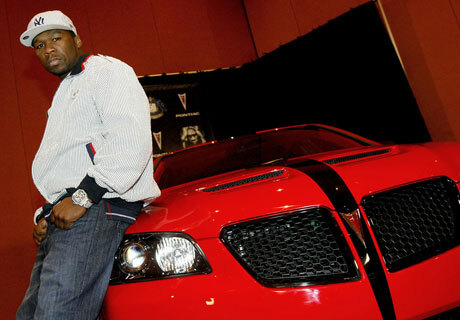 The NYC rapper originally unveiled the Pontiac G8 sport truck last March at the New York International Auto Show to discover today that General Motors Corporation confirmed the two-door, six-foot bed vehicle's 2010 North American release would not be getting the green light. Pontiac spokesperson Jim Hopson told the Associated Press that the decision to forgo this particular model is part of a restructuring plan within GM due to the recession and the company's long-term "vision for Pontiac." To add insult to injury, 50 Cent recently took another one on the chin when MTV cancelled his first reality TV series 50 Cent: The Money and the Power. After only six episodes the network explained that their decision was due to a lack of ratings and have decided to not go forth with a second season. Luckily for Fiddy nothing can last forever as his new album Before I Self-Destruct is slated for release on February 3 and will be accompanied by his directorial debut which bares the same title as his record.